When paying bills through Bill.com, funds are transferred from your bank account into a Bill.com bank account. Payments are then sent to your vendors from the Bill.com bank account (this is part of what makes our payments process so secure; your bank account is never exposed on checks, or in payment information). On the Process Date, we withdraw the total amount needed for payments in a lump sum. When reviewing account details or bank statements, debits will show up as batch withdrawal(s), not separate withdrawals for each bill payment. All payments scheduled before 3pm PT on the banking day before the Process Date will be picked up during the first pick-up run, and will be withdrawn from your bank account as a lump sum. 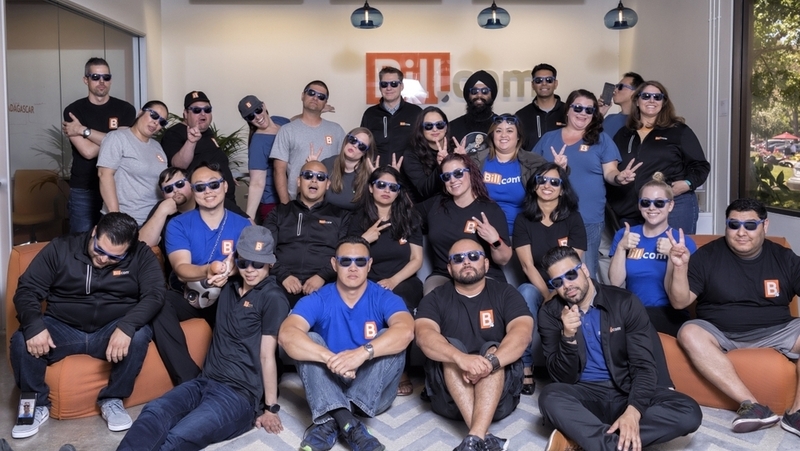 Any payments scheduled after 3PM PT on the same day, with the same Process Date, will be picked up during the second pick-up run, and will be withdrawn from your bank account in a second lump sum. Example: Monday at 12pm PT, schedule 3 payments with Tuesday as the Process Date (total: $300). Four hours later, at 4pm PT, schedule 3 more payments with Tuesday as the Process Date (total: $400). On Tuesday, two lump-sum withdrawals are made from your bank account - one for $300 and one for $400. All bills are still paid on time, the same as if we had just made one lump-sum withdrawal. After bills are paid, bill payments sync to your accounting software, and are linked to corresponding bills. By syncing them to the Clearing Account, rather than the bank account register, easily reconcile without having to match the lump sum withdrawal to multiple transactions. These accounts are set as the default accounts for syncing bills and invoice payments in sync preferences. 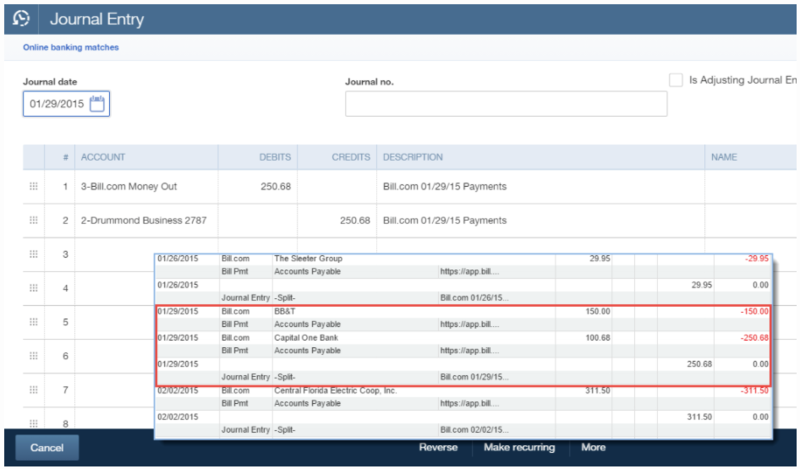 Scheduled bill payments, including those scheduled for future dates, will sync to the Bill.com Money Out Clearing account in your accounting system. When the sync runs on or after the process date, we will create a Funds Transfer journal entry, which posts a debit to the Clearing account, and a credit to the Checking account. In the end, the Clearing account should balance to $0.00 for the day. Payments made to you are posted in the Bill.com Money In Clearing account, along with the dates customers are scheduled to pay. 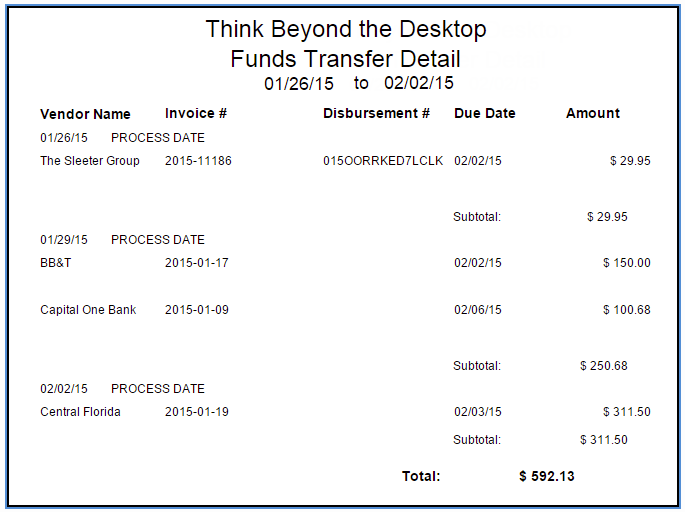 The Funds Transfer journal entry is posted with the dates the funds arrive in your bank account. Therefore, these dates may differ by about 3-5 days. Because of this delay, there may be an overlap of transactions preventing your register from balancing out to $0.00 at the end of each day. Note: Receivables payments scheduled for the end of the month may not show as deposited until the beginning of the following month. When reconciling your Bill.com Money In Clearing account, you may want to extend the period ending date by a few days. If syncing with Xero, reconciling the bank account will not automatically mark the matching line item(s) in the Bill.com Money Out Clearing account as Reconciled. If needing each line item in the Clearing Accounts to be marked as Reconciled, it will need to be done manually.